Have a problem-free rest of your summer by following the tips inside the August edition of our newsletter. 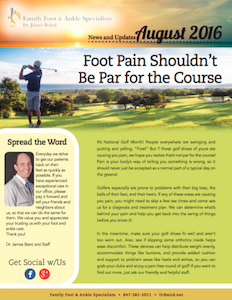 Learn how to avoid common golf injuries, what to do about tarsal coalition and stiff big toes, and check out our summer bucket list as well as ideas for end-of-summer fun! It’s all inside this issue, so be sure to take a look soon.